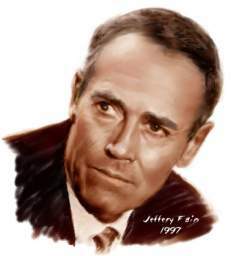 This portrait of Fonda was done by Jeffery Fain and appears here with his permission. With Bette Davis in a studio publicity shot for JEZEBEL (1938). "Waltz" by Max Steiner (a .MP3 file courtesy RCA Victor). Fonda with John Carradine (right) in John Ford's adaptation of John Steinbeck's THE GRAPES OF WRATH (1940). Fonda received his first Best Actor Oscar nomination for his performance as Tom Joad in this film. "Seems like the government's got more interest in a dead man than a live one." --as Tom Joad in THE GRAPES OF WRATH (1940). "Would you care to come in and see Emma?" --as "Hopsy" Pike in THE LADY EVE (1941). "What I am trying to say is: I'm not a poet, I'm an ophiologist." --as "Hopsy" Pike in THE LADY EVE (1941). "They look too much alike to be the same." --as "Hopsy" Pike in THE LADY EVE (1941). "Hangin' is any man's business that's around." 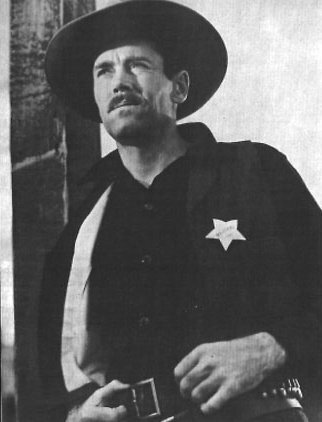 --as Gil Carter in THE OX-BOW INCIDENT (1943). "Well, a couple shots more whiskey can't do my soul any harm." --as Gil Carter in THE OX-BOW INCIDENT (1943). With Barbara Stanwyck in THE LADY EVE (1941), a very funny romantic comedy directed by Preston Sturges. As Wyatt Earp in John Ford's MY DARLING CLEMENTINE (1946), the fifth of nine films Fonda would make with the famous director.